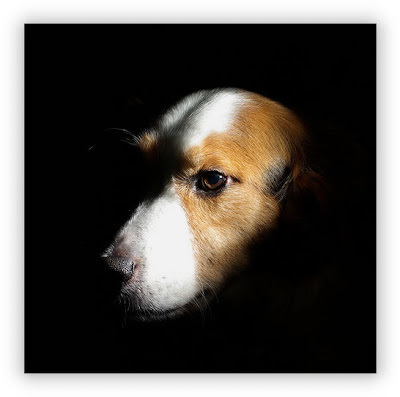 PENTAX DSLRs: Caney the super trail dog...Trails, Photography, Pentax, Friends, Caney has seen it all. Caney the super trail dog...Trails, Photography, Pentax, Friends, Caney has seen it all. If you follow this blog, you already know that the Pentax community is comprised of many special people, all sharing their passion for photography as well as other hobbies and experiences. 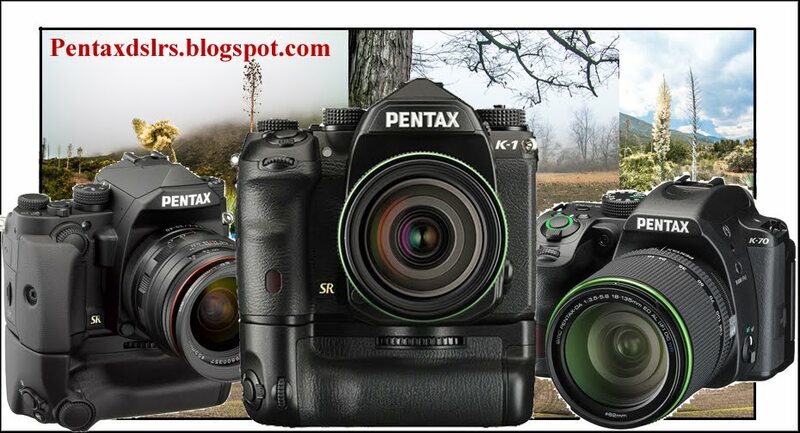 We all follow the same Pentax sites and, if not personally, we all know each other by name or Internet name. Justin Serpico, who has his own blogsite Mountain Visions and is also a moderator on Photo.net Pentax Forum, often displays pictures and short stories about his "Wonder Dog" Caney. Recently, Caney has developed some terminal health problems and has Justin and Aimee (Caney's human parents) concerned. Animal lovers understand how a pet is just like any other member of a familiy. Dogs don't talk our language, but after many years together, a dog and his human parents or siblings understand each other by feelings and intuition. If you don't believe that, you never had a dog for a long time. Unlike humans, dogs give unconditionnal love. They're always excited to see you and sad when you leave. Losing a dog is just as traumatic as losing a friend or loved one. Justin and Aimee, I feel your pain and I'm sure all your Pentax friends do too. Caney, you're a good dog and we will all miss your pictures along the trails on Mountain Vision. Take it easy for the rest of your days and eat a lot of steak, cheese and bagels. Yo Yo Dawg: Hitting the trail with a canine and a Pentax! Nikon has Ashton Kutcher, Canon had Andre Agassi and now Maria Sharapova, and Pentax has its very own unofficial spokes canine, Caney Serpico. Some time ago Yvon of pentaxdslrs.blogspot.com asked me to talk about Caney, how he fit into my life in the mountains, and how he fit into my photography. There is no simple answer and I started to write a few articles about him, but all turned into biographies (and this turned out similar, although a little shorter). He has simply been integral to a great deal of my enjoyment of the mountains, and my life, so I decided to interview him and let him tell you how he fits in, and how he became the trail dog he is. Justin Serpico (JS): Hi Caney, I'm glad you finally have given us the opportunity to interview you. Yvon asked me many months ago to write a little something about you, but you are a hard dog to keep up with since you spend so much time on the trail. Caney Serpico (CS): Hello. I'm glad I have an opportunity to be a part of the Pentax community, and am very honored that I am being interviewed. Before we start I would like to clarify something though, I am not a "dog". True, I am a canine, but I'm a border collie. The difference is similar to humans and apes. Both are primates, but humans are significantly more evolved. A border collie is a highly evolved species of canine. JS: I see, is it ok if we call you a trail dog? CS: Yes, like the patch on my first and favorite pack says, although trail canine would be more appropriate. JS: Before we get into the details of being a trail dog, one question I am sure you get asked a lot is, "are you as soft as you look?" CS: Yes, people ask that all the time, I the same big white fluffy soft haired dog you see in the photos, although I have to say I am probably softer. My hair is very fine, and the hair around my ears feels like a cloud. JS: Caney is a very unique name, does it stand for canine? And if not how did you get it? CS: I never thought about Caney standing for canine but people think it does. I was actually named after a wilderness area in Arkansas called Caney Creek Wilderness. It was the first backpacking trip my human mom and dad took together, he said it was a beautiful weekend in a very beautiful place. Justin wanted me to have a special name, something to do with being a trail dog, and he always liked that name. JS: What makes for a good trail dog/canine? CS: Really any breed can make for a good trail canine, most dogs like to be with people, exercised, and outside. Herding breeds are often the best because we are designed for the rigors on the trail. Border collies are of course the most evolved herding dogs, and have been around since the time of the Roman Empire. 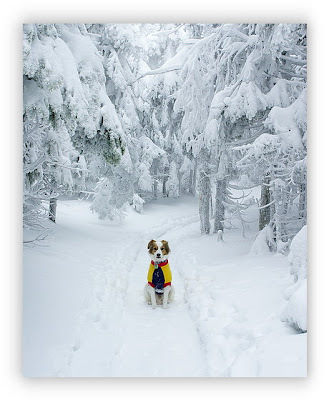 We were bread to travel upwards of 20 miles per day over rugged terrain in all kinds of weather, our chest cavity and lung capacity is bigger than other dogs of similar size so we are able to endure more exertion, and we have a tremendous desire to be active. We are extremely intelligent, and yet exceptional athletes. JS: Basically you are saying you would be a super jock-nerd if you were human, MIT scholar meets SEC athlete? CS: Yes...Justin often calls me Wonder Dog or Mutant Dog because I have always acted like a puppy and had tremendous energy and excitement! Plus, I'm more intelligent than most people we meet on the trail. JS: Are there downsides to border collies or herding dogs in general? CS: As long as you keep us active and entertained than no, but an inactive border collie can be the most destructive force on earth, leave your house for a few hours and you might come home to walls that look like Swiss cheese, or a yard with 100 three foot deep holes in it. Or we might develop OCD like tendencies, paw chewing, tail chasing. We can also be very difficult to train because of our intelligence, we pick up simple cues, and differences in tone, had gesture, or even eye contact can mean different things to us. The reality is most problem border collies are the result of inept humans and not defective canines. 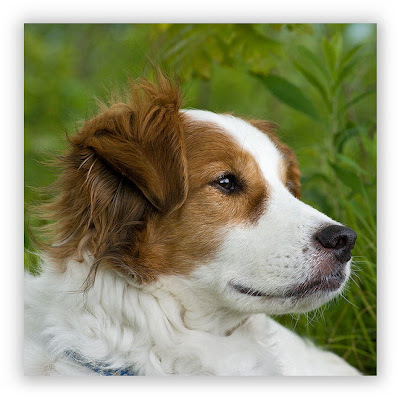 JS: So basically, a border collie or other high energy herding breed is not ideal for everyone? CS: Exactly. And it's often why we are given away or mistreated. People don't understand how much exercise and stimulus we need, and how quickly we pick up commands, even unintended commands can be taught to a BC almost instantly. JS: Were you hard to train? CS: Justin says I was untrainable, but really I wasn't hard to train. Being a serious Alpha canine, I just picked and chose what I wanted to learn and do. On the trail, I know many valuable commands like "GO", "JUMP", "SLOW" and I can follow hand signals without verbal commands. But I've never been one for stupid pet tricks, I sit, lay down, stay, and rollover (halfway...because he loves tummy rubs). I never had bad habits though, and never ran away on the trail, or while walking around town. I hate being leashed, but sometimes for my safety it's important to be on a leash when cars are around. JS: Were you a very destructive puppy or dog? CS: No, I was a very good puppy. I went through a small chewing phase where I shredded everything from foam pool toys, to aluminum soda cans (remarkably without a cut anywhere), to someone's eye glasses. I also went through a short digging phase, although I was trying to find mice, not tear up the yard! I caught a few mice and played with them over the years. Once I caught one in the house, they put him outside and he ran away. JS: Some of this sounds very destructive, how long did this last? CS; Not very long, I mostly chewed on the stuff I was supposed to. My toys, and sticks. I never damaged anything in a house, or a tent, and the only trail item I damaged was Justin's cycling gloves when I was 6 months old, he didn't get mad at me because we were in a difficult situation at that time, and he shouldn't have left them laying around. Of all the things he got mad at me for over the years, that wasn't one of them. I was very respectful of everyone's property. JS: Sounds like you were a good puppy!! Lets get back to the trail, I've heard people say you are an ideal size, can you explain that? CS: A good trail dog, is about 2-2.5 feet tall, and 30-65 lbs. Capable of carrying it's own equipment, and agile enough to negotiate the toughest of trails. JS: Why are medium size dogs best? CS: Many reasons, small enough to fit in any size backpacking tent including solo tents, eat and drink less, easier to lift if they need to help, easier to carry out if they get hurt, generally more energetic than larger dogs and don't succumb to joint problems as easily as large breeds, don't need to be carried and assisted like smaller dogs, but can squeeze through trail obstacles, or climb over them. Lots of other things too. JS: A question I know you are asked a lot is do you like carrying your pack? CS: Absolutely not. Border collies are management dogs, not laborers. Like my -human- mom, I hate wearing a pack. If you want a dog that enjoys wearing a pack, a boxer or a lab will do nicely. JS: So you don't get excited when you see your pack? CS: Of course I do, but only because I know I am definitely going if my pack is going. I also get excited when Justin packs his pack and loads up the car. Sometimes I don't have to carry a pack, and those are my favorite times on the trail. JS: As much as you don't like carrying your own pack, you do carry your own weight on every trip? CS: Yep, I'm the leader of the herd or pack, and I usually carry about the same percent of equipment and food as everyone else. Usually my pack weighs between 4-10lbs. When it gets close to 10lbs Justin weighs it to make sure it isn't more than 25% of my body weight. He never lets me carry that much, and usually it is less than 15% of my weight with the exceptions being very long trips. JS: Is it important to make sure dogs don't carry too much weight? CS: Canines are living things with the ability to suffer trauma just like humans. Herniated disk, torn ACLs, sprains, blisters, dehydration, frost bite, bug bites, and anything that can happen to a human can happen to a dog. It is very important to take things slow, and to pay attention to your trail dog. 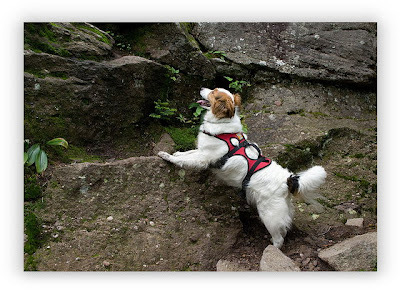 Injuries in a trail dog can be serious, and the human hiking with the dog has certain responsibilities in addition to their own safety. While dogs are far more independent than children, the level of responsibility is largely the same on the trail. A lot of people treat their puppy as unbreakable, and that is why so many trail dogs break down too soon. JS: I know you don't like carrying a pack, but how did you get used to it? CS: Justin first let me carry it at 4-5 months empty. Then he gradually added small, light things to it as filler, as I got bigger and more fit he started putting my gear into it. Usually this consisted of my food, and a water filter, and maybe some bowls. For overnights, he might trade me the filter for his dinner in there so we could just "bear bag" my whole pack. 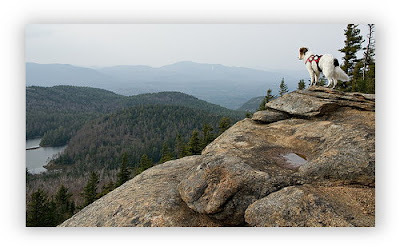 On longer trips, or trips to New Hampshire's granite surfaced mountains, he would put certain things for my paws in the bag. Vet wrap and dog booties in case my feet got cut up from the rough and sharp rocks. I probably didn't carry a weighted pack with all my trail gear till I was 12-14 months old. JS: Sounds like you always carried a fair share of the load! CS: Yes, and then some. JS: You said border collies were naturally strong and athletic, were you a perfect trail dog from the start? CS: Oh no, just like trail dogs can get injured, we need to learn just like humans. When they got me I was weak, unconfident, and Justin's dad thought I would make a better lap dog than a trail dog, and he thought my lungs or heart were weak. My first "real" hike up the 400ft Jane's Hill, the highest point on Long Island, someone asked if I was ok? They said, "he looks distressed." JS: Looking back, I remember even as a puppy you didn't tolerate heat well. You and I were very similar in preferences in temperature. Well having hiked, paddled, and rode many miles on the trail with you I will say this, your heart and desire was never weak, sometimes I think you finished hikes and kept up just by desire, but you definitely gave me some doubt early on, what changed? CS: It was my first backpacking trip, in early July 1999. We drove from Long Island to the Siamese Ponds Wilderness in the Central Adirondacks. I was afraid of everything, crossing streams, bridges, trail obstacles, stairs, I couldn't swim, and I just wasn't confident. JS: Wow, it doesn't sound like you were much of a trail dog at the start? CS: I was born as a semi urban dog on Long Island, but at the end of the 3 day trip things were different and I found my niche. On the second day we had to bushwhack through massive blow down from the microburst of 1995, and I had to leave the relative comfort of the trail for the first time and climb over and under all sorts of obstacles. Then at John's Pond, after I refused to get in the leaky boat, Justin and Aimee left me on shore when they rowed to the middle of the lake to filter water. As a pound puppy I didn't want to be left behind, so I whimpered for a bit, and then swam 100 yards out to them. I scared them since it was my first swim, but I turned out to be a very good swimmer. The following summer they got a canoe, and I often swam 7-10 miles a day along side the boat that first year. People thought they were being cruel to me, but I love swimming, and am a very strong swimmer. I don't like waves or rapids though, they are dangerous! Over the years I got more comfortable in the boat, swam a little less, but still swam a lot when they would let me, or while we were at camp, someone always had to be on shore watching me though or I would come back up, you know it's not safe to swim alone. By the end of the Siamese Ponds trip, I was crossing streams with confidence, and jumping up over trail obstructions. I remember Justin was so proud of me, and we played in the same stream I was afraid to cross only 2 days before, rock hopping back and forth for a little while. It was at this point he didn't have any doubts that I would be a great trail dog, and neither did I.
JS: (I was very proud of you, and relieved too, you were very unique in temperament from the start and I was afraid you'd be staying at home with Aimee, more than spending time with me on the trail.) Were things different at home after this trip? CS: Definitely, Justin's dad noticed I didn't listen anymore, that I was very confident and independent. I had lots more energy. JS: But you never did lose that lap dog instinct did you? CS: No, I've always enjoyed being a lap dog even with my independence. I still get on the lap of a passenger in the car for entire multi hour car trips. JS: While you are one of the sweetest and caring dogs I have ever known, you are also extremely tough. As a matter of fact, I would venture to say you could be one of the toughest dogs or humans I have ever known. Can you tell everyone why I have come to that conclusion? CS: In the last 10 years I have only missed one day of hiking that was not pre planned. JS: I think there is a lot more to it than that, I can recall the rat poisoning, the porcupine, multiple urinary tract infections, extreme cold and heat, long days with bloody paw pads, and I'm sure I'm missing a few things like 20 mile mountain bike rides at double marathon speeds, or 10 mile open water swimming days, or the time you almost drowned in the Peabody River. Tell me what you remember about those things. CS: After I started on the trail, I was very healthy and strong, but somehow in February of 2000, just 8 months into life with my new family, I found some rat poisoning somewhere and because I didn't know I ate it, and because no one believed I could have gotten into it, I came close to dying from something that was easily curable. Eventually I lost 1/2 of my blood volume, and I required almost $2500 in medical care including transfusions. Things got so bad, and I responded to the antidote so poorly that they thought I might have hemophilia. After plasma transfusions I stopped bleeding, and was almost instantly better. We took a weekend off, but the next weekend Justin headed to the Catskills to hike 2 winter peaks required for the 3500 club. He camped overnight on Slide's summit, and then did Panther in the morning. It was his first trip without me since they got me in June 1999, and he missed me. He drove 3 hours home Sunday night to get Heather and I. We got up early Monday and drove back up and did Balsam Mountain that Monday morning. I was soooo happy to be back out, and I climbed Balsam without any trouble. I was a little bit colder but I did a great job. Justin's mom was very mad at him for taking me up so soon, but I was very happy to get back out and glad he came back for me. Then there was the porcupine incident where I learned that some animals don't run when chased. I've never tried to hurt an animal, but I do like to chase them at times probably because of my herding instinct. I ran right into a 30lb porcupine with quills opened and let out a series of whimpers. I had quills in my snout, nose (looked like a voodoo witch doctor), my shoulder and chest. There were so many and they were so deep that when Justin and Aimee tried to hold me down and pull them out they couldn't do much. I'm small, but strong as they found out. I had to hike out almost 4 miles over rough and steep terrain on only 3 legs. From the time I was 5 I've had a lot of bladder infections, really for the last 5 years, and I've always been eager to hike. We had to come home from an October 2006 3 day backpacking trip because I had a severe infection with blood that was showing up on the fresh snow, but after seeing the vet and getting my medicines, I was back out the next day doing the Devils Path in the Catskills, one of the toughest day hikes in the United States. I out hiked my two human companions as usual and got a big piece of steak as a reward. I don't really want to talk about the Peabody, I told Justin it was unsafe because of the high water levels and he insisted we keep going because no mater what we had to recross it. Finally, I fell in and was caught in a strainer (downed tree) because of my pack, I was being pushed under. Justin jumped in and pulled me free. I think we used 2 of my 9 lives on that trip. Last year, was the first time I didn't think I could hike out, we hiked 2 of the most rough and technical trails in NH's White Mountains. Trails that most "dogs" couldn't do on a good day. The Caps Ridge, and King Ravine, not to mention the Cornice, over a 3 day backpacking trip. The conditions were brutal. Even at 5000+ feet it was 80s and 100% humidity. I love technical trails, I can climb exceptionally well for a canine without fingers or sticky rubber soles, but the King Ravine was filled with dangerous crevasse like drops that could eat a person up, let alone a 45lb dog. In the extreme heat, Justin felt like we'd made a big mistake, and my paws were already raw from the first day. Unfortunately, going down the King Ravine is equally tough and still required a 1000ft ascent back to camp, so we had to complete it. I did a great job, only needing help a half dozen times in 2000 technical feet of climbing. The RMC guidebook says the trail is not recommended for dogs, and in that heat and humidity I agree, but on a cooler day I'd have eaten that trail for breakfast. The biggest problem was I had to hike out on the 3rd day, and the hike out was the same rugged terrain as the first day including several miles over rough, sharp talus and scree. 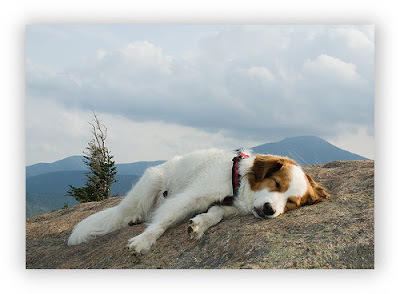 I wanted to stay at Crag Camp, one of my favorite hiking destinations because the people and the Randolph Mountain Club are very dog friendly, but like usual we had to go home. I did my best, and made it out without needing to be carried. Justin was very proud of me. JS: You mentioned above you are the leader of the group, but you are a canine traveling with humans, how can that be? CS: I'm very safety conscious, and I set a good pace, I don't get flustered because the weather is bad, and I keep the group together. I also express my concerns if the weather looks dangerous, or the terrain seems unsafe, or if I feel what someone is doing is unsafe. I set the tone on a trip, and at times I've been the navigator in bad weather. Humans will often find me 100ft up the trail, peering down from a rock outcropping with the look that says, "hurry up we have a lot of ground to cover." If you are really slow, I might have to come back down and give you a bit of encouragement from a whimper and a tail wag, followed by a spring back to the front. JS: People have commented on how you don't like the group to spread out. Is this your herding instinct at play? CS: Yes, although I really don't have a strong instinct, which is actually a good thing, it is there. I never liked playing fetch but I love chasing people with the ball or otherwise, I actually play more football than fetch and it's something I have done from the start. When I play with other dogs, we play keep away. But on the trail I am very concerned about the group not sticking together. I have never been comfortable with Aimee and Justin separating. JS: I have noticed if someone is doing something unsafe, you tend to get very concerned and vocal. How do you know something is unsafe? CS: Humans aren't nearly as smart as they think, and Justin has gotten hurt many times when I haven't been there. Animals are less interested in impressing someone or being cool than staying safe. I'm a good decision maker and have good instincts. JS: Yvon of Pentaxdslr.blogspot.com asked me to do this interview to find out how you fit into my photography, can you shed some light on why you have been important? CS: I never thought much about photography, many border collies have photographic memories, and hardly ever forget anything, or anyone. Justin is always toting some sort of camera (usually a Pentax SLR), and always pointing it somewhere, often at me. While we are moving or at camp he loves me in the photos, but when he's shooting a landscape or panoramic I can sometimes get in the way. JS: There is no doubt you've been instrumental in many photos, as referenced by comments, user feedback, and views of images with you in them. You always seem to appreciate where you are, you do seem to take in the views, and the respect and appreciation for the places you have been is clear. Why is it that you seem so unique among canines in your photos? CS: I don't know, but I have always gotten to a viewpoint or some other scenic location and stared out into the distance from the very first trip. Canines are supposed to be mainly influenced by smell and sound, but I have always appreciated the sights I see from the tops of mountains or overlooks. I suppose this has led to Justin's photos of me being a bit different, more introspective in nature than just a "dog" in a photo. JS: Yes, I think that really is the difference, it's not so much that if you were a human it is conceivable you would make the top of People magazines most beautiful people awards. That certainly doesn't hurt, but it's the substance of the gazes and your eyes that really make the shots. You are the rare cute puppy that turned into a handsome dog. Are your colors unique to border collies? CS: Tri color BC's are less common than most other colorations. The only undesirable color of BC in breeding is pure white, I am mostly white, but my black spot at the base of my tail, and my facial markings are very unique. I also have black spots on my undercoat that have never come through to the top. My crate tag at the animal shelter said I was a border collie X but we are pretty sure I am pure bread because of my mannerisms, body shape, intelligence, and endurance level. 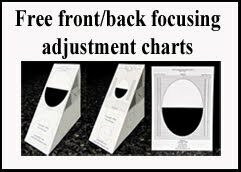 JS: You seem to have a lot of unique qualities from looks, to athletic abilities, to toughness, to intelligence, to introspect, and many other personality traits that are sometimes reserved for humans. You rarely bark but you often grunt like you are trying to talk, if someone gets hurt you are the first one to check if they are OK. A lot of people have commented to me that you almost seem to truly understand what we are saying to you, rather than simply respond to commands, can you give me an example? CS: A lot of people don't feel like spite, anger, love, compassion, or emotions are found in animals but I disagree. I always am compassionate and gentle with animals smaller than myself. My best non human friend was a rabbit whom I cared for. I let him out of his cage, I fed him my food, and we played together, and when he died I was there, guarding his cage and pawing at him to wake up. JS: I remember that vividly, I also remember how depressed you were when he was buried and for weeks afterwards. Truthfully, I think it took you months to really get past it, what were your feelings? CS: I didn't want him to be buried. I whimpered and tried to stop it because I didn't want to believe he was dead, and I tried to dig the dirt up as you and Christian shoveled it in the grave. JS: That was one of the most touching things I have ever experienced, but you never touched the grave once we finished filling it in. Why? CS: I knew he was gone. He was my best friend, and I missed him but he was gone and digging him back up wouldn't have helped. JS: One thing I noticed over the years hiking with you was that you never pooped on the trail or in the campsite, this is something that always impressed me and showed me you had respect for these places, can you tell me why you never seemed to litter the trail? CS: Dogs are often banned from places because they are a nuisance to wildlife and other hikers, but the reality is a little poop is less destructive than a name carved in a tree, or on a rock, or graffiti, or broken glass, or Power Bar wrappers and cigarette butts. Dogs aren't responsible for any of those things, yet they are common in the wilds. Most nuisance dogs are brought to the wilderness by the same nuisance humans responsible for all the above. I love and respect the places I go, and they are my home for all too little of my life, so I treat them like my home. I don't poop in my bed, I won't poop in my campsite. I often am more protective of my tent, lean-to and campsite than I am of my real home I don't understand why humans are so destructive to places of such beauty and fun! 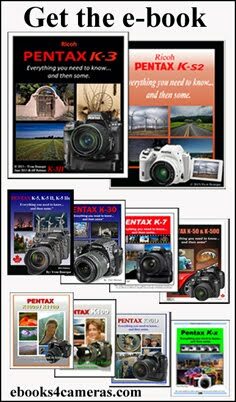 JS: I know with your photographic memory you don't particularly care about cameras or photography, but a lot of wonderful images have been created of you over the years, can you comment on why Pentax cameras have been instrumental in capturing your adventures? CS: Absolutely! Pentax is a brand for people who are able to think for themselves. It's for the trail dog in everyone. They are essentially the trail dog of cameras. On the outside the specs don't always blow you away but they are rugged, tough, dependable, and just like trail dogs have a loyal following because they have been largely loyal to the people that use them. A lot of the other brands are probably good as well, but there is nothing exceptional or unique about what they offer. JS: Thank you for the interview Caney. You are the sweetest, brightest and toughest canine I have ever met, I have thoroughly enjoyed every hike/bike/paddle/climb we have been on together, and missed you every day we were apart. I feel like almost all of my outdoor life has been shared with you. We were VERY lucky to have found a trail dog as unique as you. I am 100% confident you have earned the respect of every human hiker, cyclist, paddler, or climber that has been fortunate to spend time with you. As a lot of people have told you and I, "Caney is one cool dog." You are definitely the ultimate trail dog! 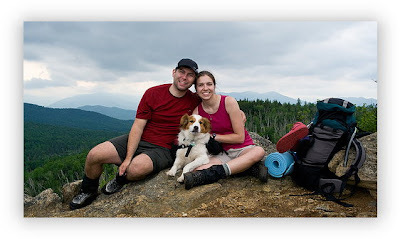 CS: Thank you for the opportunity to talk about trail dogs, hiking, and photography. And thank you for all the time I have spent on the trail over the years, even if it wasn't nearly as much as I wanted. The one question I wanted to ask was this: Did you take modelling lessons, or are you just a natural in front of the camera? Justin is like a German Shepherd, fairly intelligent, fairly athletic but a little rough around the edges. Definitely not Border Collie material. The modeling was purely natural, I just never try too hard, so my shots rarely look posed. You're the only reason I survived that trip to Balsam Mountain. Justin surely would have let me wander off and have the wolves eat me in the frigid climate. But you led me back to the car and kept me warm and safe.